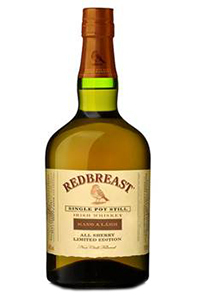 February 3, 2015 – For the first time, Irish Distillers is making a limited-edition Redbreast expression available to members of The Stillhouse, the affinity group for fans of Redbreast and the Pernod Ricard unit’s other Single Pot Still Irish Whiskeys. Redbreast Mano a Lámh also is unique in that it is the first Redbreast expression to be matured exclusively in ex-Sherry casks. The core Redbreast expressions are matured in a combination of ex-Sherry and ex-Bourbon casks. The name comes from the combined Spanish and Irish Gaelic translations for “hand in hand,” reflecting the ties with Páez Morilla Bodega in Jerez, Spain. Irish Distillers has its casks handmade at Antonio Páez Lobato Bodega, then sends them to be seasoned with Sherry for two years before using them at Midleton Distillery in County Cork. Mano a Lámh carries no age statement, as Master Blender Billy Leighton used casks of various ages to create the expression. In a news release, he described the challenge of blending Mano a Lámh. Mano a Lámh is bottled at 46% ABV, with only 2,000 bottles available exclusively to Stillhouse members through the Redbreast web site for €65 ($74 USD). Because of shipping restrictions, the whiskey will not be available in the United States and a number of other countries. Mano a Lámh is the first of what is expected to be several new releases in the Single Pot Still range during 2015.